The other day, I talked about breaking seasonal blogging rules when I posted my Blackberry Cheesecake Bites in the middle of September. I warned you that I had peaches. I had bags of them. My aunt brought them right from her peach tree at the end of the summer. How wonderful!! But I wasn’t sure what I was going to do with them. I’ll be honest, a few made it right into our mouth, but the majority of them got sliced and frozen for that mid-winter craving for summer flavors like a Blended Peach Margarita …. oooooh, I could go for that right about now. The truth of the matter is that summer has officially ended. I feel like I missed so much of it because we were focused on getting and staying pregnant since about June… and in a blink of an eye, here we are. At the beginning of Autumn. Although I do have peaches, I couldn’t go completely against the grain of the seasons. So I decided to spice things up. 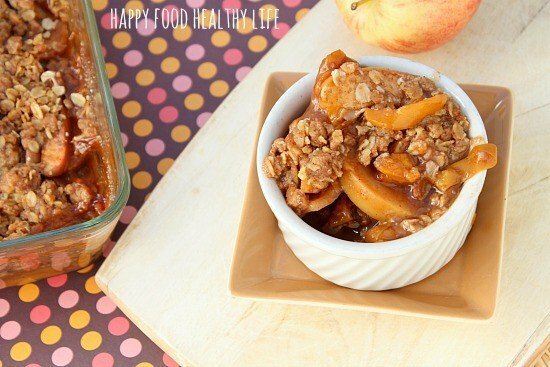 Everyone does a peach cobbler, crisp, crumble sort of situation. I wanted to switch it up a bit. 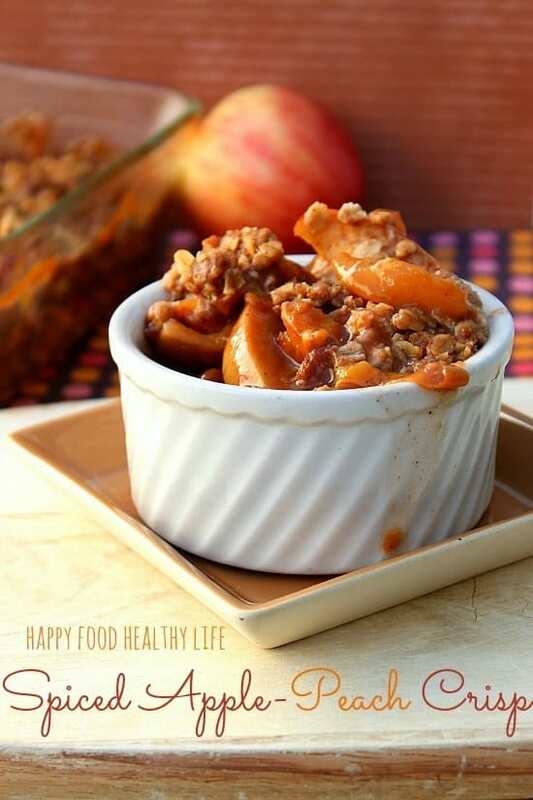 I thought, why not grab a couple apples and use some of those wonderful autumn spices that we all love because they make our homes smell delicious! On top of this recipe going on in my head, all weekend I was craving whiskey, one of my many drinks of choice (among coffee, wine, beer, and of course H2O). So it only seemed natural when I started putting the ingredients together in my head that I transformed a summery crumble situation into a spicy dark fall-flavored situation with a bit of alcohol. This was definitely something I could get into! Of course, the whiskey will all bake out. This isn’t a dessert you or your kiddos are going to get drunk off of, but if you aren’t comfortable with the liquor, just use water – not a big deal. The flavors just won’t be quite as deep and dark, which was what I was going for. Places I would want to enjoy this crisp: A Halloween Potluck. Thanksgiving Dessert. Christmas Eve around the fireplace. Every Sunday evening for the rest of my life. Seriously you guys. If you have any peaches left, make this happen. Hell, you might even just want to grab some canned peaches and improvise because it’s THAT worth it! To peel peaches easily and quickly, you will want to make a small 'X' cut into the bottom of each peach. Boil a large pot of water and carefully place peaches into the water. Boil for only one minute and promptly put peaches into a large bowl of ice water. This will allow the peelings to come right off when you rub them. Pit and slice them along with the apples, which are fine to leave the peels on. Set fruit aside. To make fruit mixture, in a large skillet (large enough for all fruit), combine Whiskey, cornstarch, brown sugar, vanilla, clove, nutmeg, and cinnamon. Of course, if you are not feeling up to the Whiskey, there is no reason why you can't use water instead. No harm, no foul. Just not as dark of a flavor. Bring mixture to a slight boil and stir occasional for about 5-7 minutes or until it starts to thicken slightly. Once it becomes syrup-y, add peaches and apples into the skillet and coat with the sauce until all fruit is covered. Place coated fruit in a small baking pan that has been buttered (I used an 8x8 glass pan). 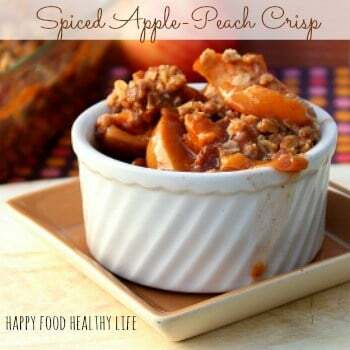 To make the crisp, combine brown sugar, flour, oatmeal, clove, nutmeg, and cinnamon in a small bowl. Add the cubes of butter, and with a pastry cutter or fork, cut in the butter until you have small pea-sized bits of dough. Spread evenly on top of fruit. Bake in a 400 degree oven for 25-30 minutes, or until top is golden brown. Looks gorgeous Holly! I love that you added the whiskey, I bet the flavor is deeper and richer. I can see eating this every Sunday for the rest of my life too! Yum! I think I will try this sometime. I love cooked apples and peaches. This looks and sounds delicious! I’m now following your blog. You’ve made me hungry lol! So happy to have you here! You have got to try this crisp out for yourself. You’ll love it! Thanks Heather! My photography is always a work in progress, that’s for sure. This is one piece I’m actually proud of. ooooh, this crisp for breakfast… NOW we’re talking!! Thanks for checking the recipe out Katherine! This looks great! I’ve been spiking apple butter with whiskey this fall. My name is Katie and I host <a href="https://redcrowgreencrow.wordpress.com/2013/09/28/fall-into-the-holidays-2/, open Saturdays. I would love to have you link up! mmm!! Apple butter with whiskey sounds deLISH Katie! Lisa, You’re right… whiskey really does make it so much better! Looks so yummy! Thanks for sharing. Stopping by from the best blog recipes link party! I’m just swinging by from Whimsy Wednesday Link Party!! I would love if you’d drop by to visit me sometime at http://fromgatetoplate.com. I look forward to seeing you there. Holly this looks delicious and your photo is amazing! I can’t wait to try this! It looks amazing, I think apples and peaches would be an awesome combination. Thanks for sharing this with the Less Laundry, More Linking party. I was surprised at how much the apples and peaches complimented each other. The spices really brought the two together, and it was one happy marriage! Is there a reason why the peaches were peeled? What would happen if the peel were left on? Thanks! Grace, I actually tried it with unpeeled peaches, and the peels fell off with how tender they got during baking. It wasn’t a huge deal, but I didn’t necessarily love the idea of just chewing on peach peels without the peach. personal preference. Leave them on if you’d like.